4 - Closing Date: Midnight on 10th January 2016. 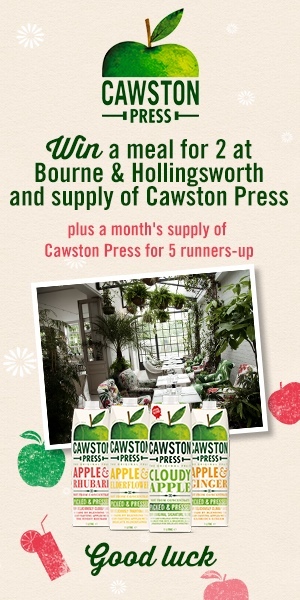 6 - The Prize: One £125 voucher for a meal for two at Bourne & Hollingsworth and one month’s supply of Cawston Press drink consisting of 4 x 6 x 330ml Cawston Press Sparkling soft drinks; 6 x 1L/750ml Cawston Press Original Blend Apple Juices and 4 x 3 x 200ml Cawston press Kids’ Blends. Five runners-up prizes consist of the one months supply of Cawston Press.